The spherical shape of a bubble is subject to the surface tension. 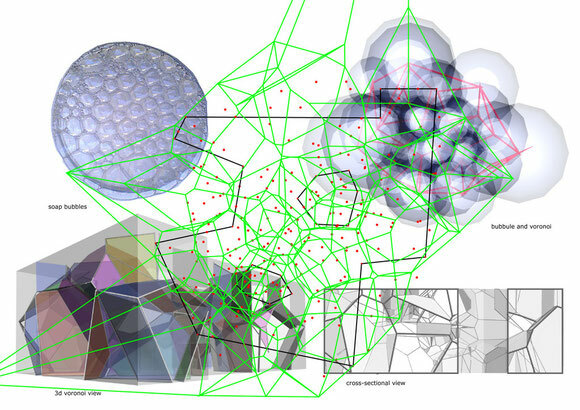 The soap bubbles have the spherical shapes while the voronoi cells have tetrahedral ones although these two have the same spatial partitioning systems and the centres of each cells or spheres are connected in the smallest distance possible between those neighbouring cells. about how to interpret them and make them habitable with the floors and the polygonal skeletons. The likely programmes or projects for application. -Any types of the building programmes including the public buildings. 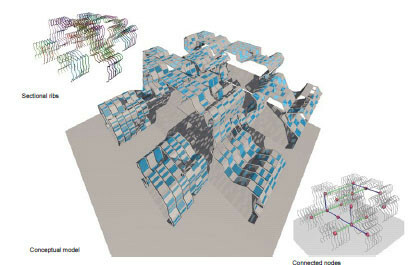 A model emerged from the slime mold and the wave algorithm is based on its related biological background and expects to show us interesting results for the space use and the innovative solutions of the floor occupation and the interior. It appears that those spaces are quite useful and explorative for very creative users examining the new spatial organization which challenges to be very different from that of the past. The model itself aims to be described at the abstract level giving the imagination to and an occasion to talk with the potential clients about the matter. Furthermore, there are varied options for the external skins, whether be conventional or eco-tech facade,for the model. In this exploring process, it has been found that the model created can't predetermine so decidedly those skins but these can be fitted into it with a formal variety. In addition, it is substantially clear that a large number of the wooden materials and concrete structural systems can be adopted or explored for this model thanks to the actual advance of the technology of the building industry which enables apparent structural components more feasible than ever. 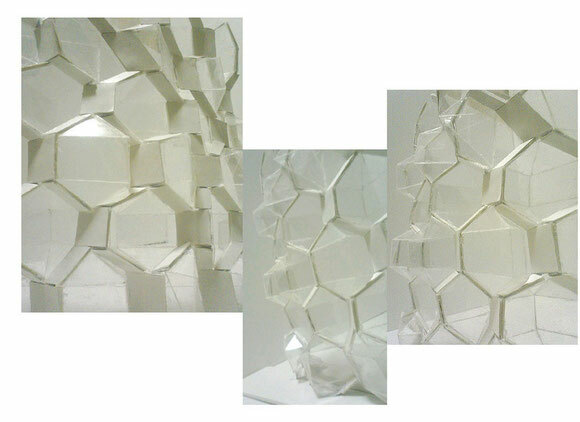 This model represents the crystallized skin with hexagonal cells giving to viewers the impression of the soap bubble. All this contributes to create the metaphorical buildings envelope within the area for the planned buildings. and cutting edge structural design intended to be integrated each other in the explorative ways. A biological model for this algorithm is omniscient of the soap bubble, represented by paper models with honeycomb cells which contain formal and structural properties of ribs. The algorithm is further completed by the neural network with honeycomb grid on the cylinder and three to a number of inputs. This neural network is that after those input are on, the shortest path between a node on the grid and those input is chosen as the winner and the neighbouring nodes around that winner are deformed through time creating intriguing deformed skin features. The above algorithm is run changing a few key parameters which create different patterns with two distinctive formal and spatial features of the skin. One of them is cell size and another is ribs. Those skin properties with the cylinder are very significant because they influence to views from the inside and create the ecological facade system including the solar panel fitting and proper shading system(dimension of ribs and cells, and angles of ribs) as well as the aerodynamic system with the wind shielding.. Furthermore, this deformed honeycomb skin can form the structural external facade which can be load-bearing dispersing all surface forces on the entire skin. Furthermore,this honeycomb skin intends to be distinctive to many of this kind of shapes, containing the 3 dimensional cells with the recess and the excess, and creates the intriguing the spatial and aesthetic experiences both outside and inside. -The environmentally controllable skin systems with the variation of the cell size, cell density and ribs for all building types. -The structural surface(dispersed forces around the surface). 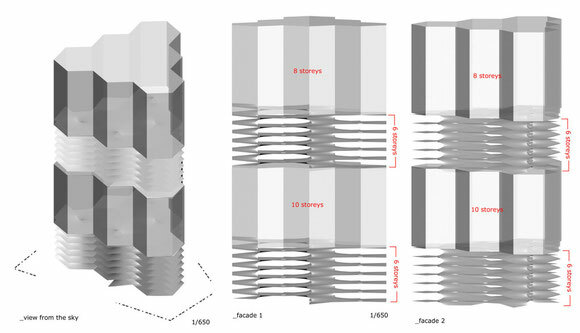 The conceptual models shown here are created by the generative and analogue techniques with the parametric design which starts from the simplistic forms and thereby creates the complex forms later. The band systems are characterized by the biological model like body plan, a key feature of an organism's morphology and very abstract form of the phyla. All aspects of its body plan are exemplified in an organism's symmetry its number of body segments and number of limbs. Thus, in order to make artificial gadgets like the model on the right, the body plans or structural features are modified under the certain rules formulated. The cinematographic motional sections or dynamic sections on the running horse create very self-similar forms when they are glued together. The band systems are composed of the sectional frames and opaque and transparent panels. The degree of excessing, recessing and hanging of the boundaries can be controlled. For instance, a part of boundaries of the cells put together can be lowered more in order to create the subspaces instead of the large roof-like cover of the model. 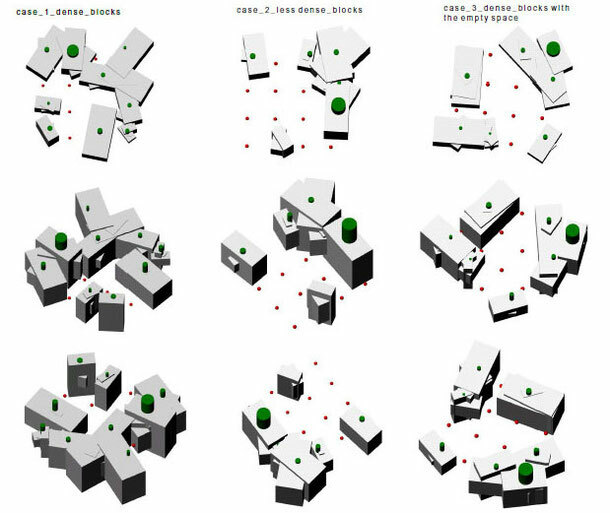 The cellular automata is used to draw up the overall volume plan of the object and relate all of neighbouring spaces under the rules of neighbouring..